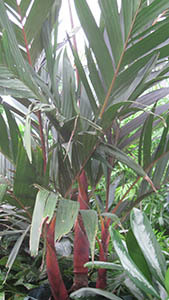 This beautiful clumping palm has a new red leaf and red crownshaft. It tends to clump more freely than the orange form and is certainly more sun tolerant. 200mm $33.00 Special price: $0.00. No online sale. 250mm $79.50 Special price: $0.00. No online sale.